The entry below comes from current Sun intern Angela Lu. My seat in the newsroom has a view of the downtown library’s front entrance, so I’ve watched with mild curiosity the past few weeks as a plaque by the front door was covered, then uncovered, then covered, then uncovered. (I also watch with curiosity every morning when a guy walks by, like clockwork, with either an 18-pack of Budweiser or Coke in his hand. But I digress.) Here’s a little story on the plaque go ’round. The Kitsap Regional Library’s downtown Bremerton branch, named for Martin Luther King, Jr., planned on unveiling a new plaque dedicated to the civil rights leader last Monday. After it was installed in January, the plaque, about three feet by a foot and a half, was covered with duct tape and plastic. 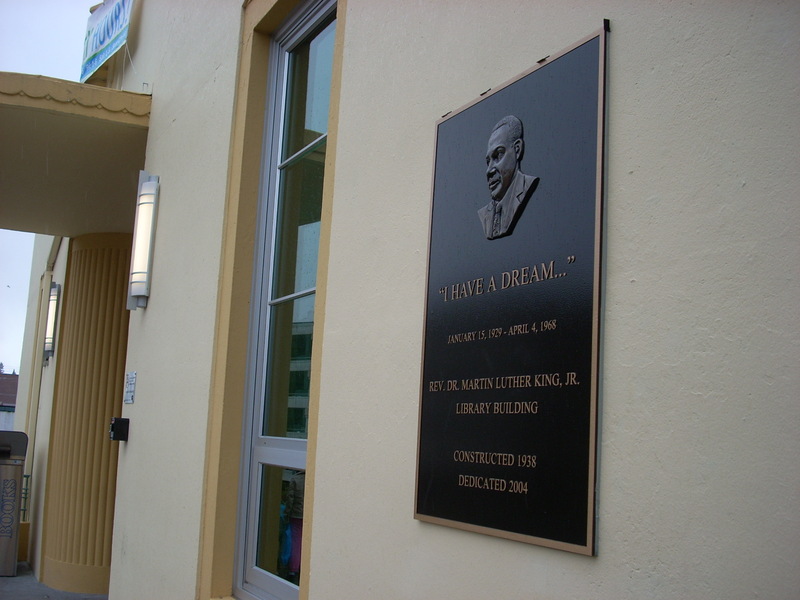 But library staff felt it would be disrespectful to keep the plaque covered over MLK holiday weekend, and uncovered the plaque to zero fanfare on January 19, the holiday that honors King. The covering never returned, and the plaque could be seen by any patron. That was until Monday. The library planned on a formal unveiling that evening with members from the local NAACP chapter, and Neal dutifully re-covered the plaque with a black veil. However, after waiting for 20 minutes, the NAACP still hadn’t shown up, and a light rain that had been on and off through the afternoon had started. Neal had no choice but to take the veil back down, in fear that someone would steal it. Joan Ferebee of the NAACP said the group had visited the library earlier that day, but seen scratches on the plaque. They decided they couldn’t unveil it in that condition, so they called the library and told another librarian that they were not coming. Apparently Neal did not get that message. Ferebee said she’ll be talking to the library to set a new date for the unveiling. And the covering may go up just once more. Scratches on the plaque stopped the unveiling? The library staff did the right thing to unveil the plaque on MLK Day and should have been commended for their thoughtfulness. I hope they were. I’ll keep an eye out for worn looking signs so they can be redone too.